The electron contribution to the previous expression is negligible compared to the ion contribution, because . 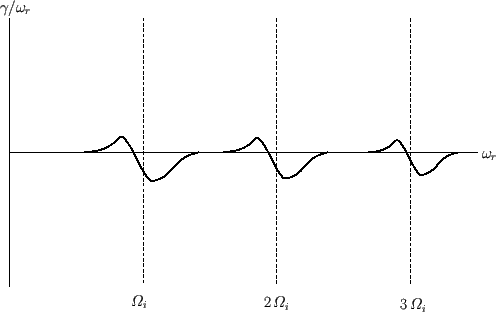 Figure 8.11: Schematic diagram showing the growth-rate of the Harris instability as a function of its real frequency. It can be seen, from the previous formula, that if then for all values of (recall that ). In other words, there is no instability if the perpendicular and parallel ion temperatures are equal to one another. On the other hand, if then there is a range of values for which each term in the sum on the right-hand side of (8.170) is positive. In other words, there is the possibility of an instability. The variation of with is shown schematically in Figure 8.11 for a case where is relatively large. It can be seen that the growth-rate is positive in a narrow range of real frequencies lying on the low frequency side of each harmonic of the ion cyclotron frequency, and negative in a similar range of frequencies on the high frequency side. If this inequality is not satisfied, then the negative contribution from the th term in the sum predominates over the positive contribution from the th term. Observe that the previous inequality becomes harder to satisfy as increases.